Edward H. Lundquist: Tell me a little about Portugal and Portuguese Navy, where Sea Sparrow fits in, and then your involvement with the consortium. Capt. Nuno Sarmento: That is not an easy question. Portugal is historically a maritime country and we celebrate this year the 700th anniversary of the Portuguese Navy, therefore I could spend all interview only with this topic. Let me focus on some relevant facts that will help you to understand what our challenges are. The size of the maritime areas under Portugal’s sovereignty, jurisdiction and responsibility represents approximately 63 times the surface of its land territory, which demands a modern Navy capable to act at sea, in order to defend national interests and to contribute to global security and stability. As the Navy supports the National Maritime Authority (organization with constabulary role in our maritime domain) with human and material resources, we can affirm our dual role, the military role in deterrence, defense and support to foreign policy and the non-military role regarding security, safety and state authority, as well as economic, scientific and cultural development, in a more efficient and coordinated way. Regarding Seasparrow, in the early 1990s we selected Sea Sparrow to be the air defense weapon system on our Vasco da Gama-class MEKO frigates. We obtained the RIM-7 missiles from the U.S. through an FMS case, and we joined the consortium since it was the best option to guarantee the support of the missile fire control systems for our ships. Therefore, although the system was new for us, it had been around for a while and the consortium was considering improving the weapons system and developing a new missile. We weren’t ready for an upgrade yet, the way some of the other countries were. Sea Sparrow itself was and still is our main air defense capability on board of those ships. Later, we acquired two Karel Doorman-class frigates or M class frigates from the Dutch Navy, which we have named the Bartolomeu Dias class, and they also came with the Sea Sparrow. As the RIM-162 ESSM became available, we evaluated the option but decided to stay with the RIM-7 because those missiles were still relatively new for us. Was the configuration similar on your two classes of frigates? They are similar but not the same. In the Vasco De Gama class we have a Mk 29 launcher and in our M-class frigates, we have a Mk 48 vertical launcher. Both combat systems are of the so-called Dutch configuration, but slightly different from one another. As the threat evolved and the consortium started to consider improving the missile, we began looking into the development of ESSM Block 2, as an upgrade of our Bartolomeu Dias-class frigates, since they are the newer ones. We recently changed our status in the ESSM Block 2 program from non-contributing participant to contributing participant. Will Portugal participate in the industrial work for the missile? We were a non-contributing participant for ESSM Block 1 and therefore our industry did not participate in the workshare at the time. With Block 2, we will have our industry involved in the development and production of the missile. Transforming defense spending in industry investment is a key factor of our strategy. You are not only buying a missile, but you’re developing your technology industry in Portugal. It’s a major difference between buying something and being part of the development, where you own intellectual property of what is produced. And you can leverage that capability beyond this missile to other business opportunities, either military or commercial. Absolutely. We have a strong defense industry in areas as software development and communications systems but we found that the majority of our industry that could work in the hardware of a missile was not looking to defense, but rather other areas, such as space. This is an opportunity to those industries to diversify their portfolio and participate in an industry network. The business relations that they create here are not restricted to this specific project. It is a learning process for all of us. Portugal is one of the founding members of NATO. Yes, we are one of the twelve countries that sign the North Atlantic Treaty in 1949. Does Portugal look at being involved in a joint program such as the consortium as another way that Portugal can underscore, or confirm, it’s commitment to the Alliance? Definitely. The consortium started in 1968 as a response to an emerging threat and need to defend high value ships against cruise missiles and become probably the oldest cooperative weapons development project in NATO’s history. Participating in the consortium is a visible way to practice the cooperative spirit of the NATO Alliance and shows our strong commitment to NATO. Through our frigates, where we have this system, we contribute to the warfighting capability of the alliance; and we participate in the consortium that manage the life cycle of the systems for all of the members. When the Sea Sparrow system was first developed, it was a stand-alone launcher missile sensor, fire control, combat management system. For Portugal, we had the missile integrated into our combat management system. Regarding the missile system, compatibility and interoperability are important characteristics for us. Although different countries have different solutions for combat management system, we still try, as much as possible, to benefit from common approaches. Have you had a chance to get kinetic with your missiles, and have your ships conduct actual firings? As I have said, we don’t have ESSM yet, but we have performed live Sea Sparrow firings – but, of course, not as many as we would like. When we do conduct tests, we typically try to test stressing scenarios against air and surface targets, areas where there may be uncertainties about how the missile would perform. One of the benefits of the consortium is that we share performance information and firing results. We don’t want to duplicate efforts so, during a firing preparation, we use shared data to find scenarios that would fit our testing purpose but also would bring more information to the greater benefit of the group. I think that’s an important advantage for a navy like the Portuguese Navy, because we would not have the resources to do everything on our own. Our frigates participated in several real-world operations (e. g. Adriatic during 90s), with our Sea Sparrow missile system always achieving a very high level of availability and readiness but, fortunately, although we were close a few times, we never had the need to fire against real-world targets. Do you conduct the test and analyze the data as a group and share that data? Do they all participate in observing the test? Or do you just go out and do it yourself and share the report? That depends on the firing objective. In the majority of the firings that we do in the consortium, the country plans for itself. It might conduct a combined exercise with other countries. If that’s the case, there’s a common planning approach and a common effort. As I mentioned, we share firing and performance information and we participate in meetings to discuss the lessons learned. It’s the knowledge we get from those firings that creates value for us, and it is a benefit to the whole group. 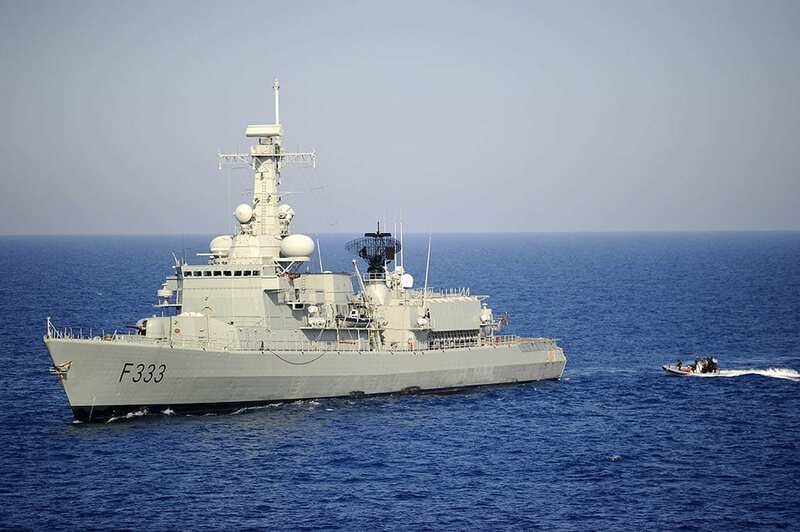 How important is cooperation for Portugal’s Navy? Cooperation is critical and I personally believe it is the only affordable solution for a country like Portugal. All our major programs are being developed considering cooperation with other nations. We believe that international cooperation and industry participation is paramount in defense investments, is a priority of our government and we believe that this consortium is a great example of that.